There’s nothing better than a hearty curry recipe in fall. 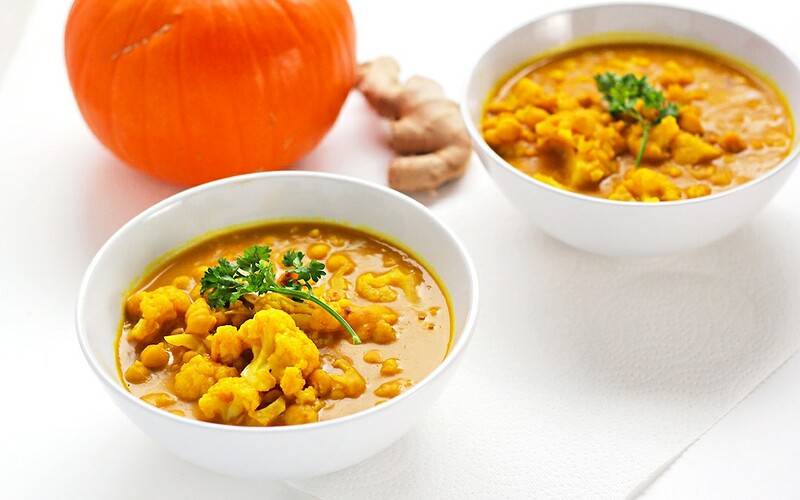 With this pumpkin curry, you’ll get the anti-inflammatory effects from turmeric, immune-boosting properties from fresh ginger, and healthy fats from the coconut milk. Pumpkin, chickpeas and cauliflower give this recipe a great fiber boost, keeping you fuller longer. This curry is fabulous as an easy one-pot vegetarian entrée any night of the week! Double the batch to have leftovers for lunch the next day. Add coconut oil to a medium pot over medium heat. Add the onion, ginger and garlic, and sauté for 5 minutes, until fragrant. Add the pumpkin, coconut milk, curry powder, turmeric, salt, chickpeas and cauliflower. Bring to a boil and then lower heat to a simmer and cook for 20–25 minutes, until cauliflower is tender. Serve hot.